EasterEgg's remake of R-Type game is probably one of the most noticeable production that has been made lately. Great reviews of the game itself are already available from multiple sources so this article won't be another one like others did. Instead, today I would like to focus only on the exceptional packaging produced for the game. It's clearly something that worth major highlighting. Everything looks professional in it. Clearly: I'm impressed and want to share this awesome feeling with you. Richard, also known as TotO, the graphical artist involved in the game, is also the big one behind this project. I asked him to answer my questions, and he kindly accepted ! Disclaimer: some of the texts were translated by me from French to English.. but I tried to preserve the original interview's mood and everything got reviewed by Richard before publication. 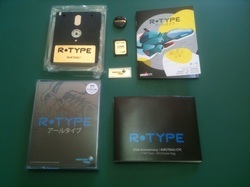 Official package of R-Type "Collector Edition"
1/ Hi Richard. Please could you briefly present yourself, as the whole EasterEgg team? Hello Arnaud. My name is Richard GATINEAU and my pseudo is TotO. I'm an old french CPC fan and my hobby is to make video games design and graphics. 2/ Could you give us a quick overview of the package's content ? 3/ Are iXien and Fano involved in this project ? If yes, what did they precisely do ? Not really. It's more a personal project that I wanted to do to materialize this game. iXien enjoyed the idea and supported me and gave some ideas by consulting his great games collection. He checked sentences and typos inside the Manual too. 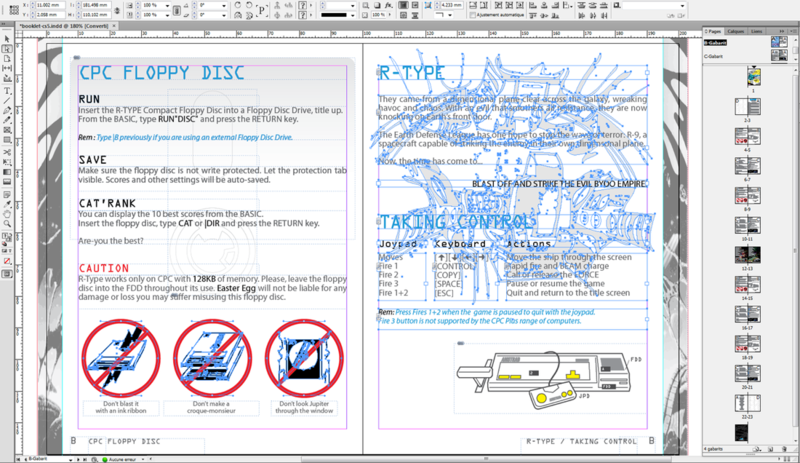 4/ Manual is professionally printed. It's looking great. How did you proceed ? Was it expensive ? Yes, it's professionally printed. I had to make use of a real printer since I wished to get a result that did not look "homebrew"-styled. Such a result would have been a failure. Of course, printing is not all... without a good content, you can't get a feeling of good quality. So I had to learn how to use professional softwares like Adobe Illustrator (drawing) and Adobe InDesign (layout) in order to work with vectorized-units using CMYK-color depth. Even if I knew what were the major constraints, at the very beginning of our R-Type remake creation I did not spend too much focus on this since I actually asked a friend to make this job. Unfortunately, we were quite busy in creating the game and started to loose focus on this project. With time, my friend was not available anymore to help me, so basically I had to cancel the boxed version of the game.. or create one by myself. In the end - like I initially thought about - this allowed me to express my creativity the way I wished and obtained the result we have today. I worked on several templates for texts & art that I then reused from page to page, for each languages, because it's important that everything keep coherency. If I could give an advice here : do not hesitate to recreate from scratch till result is convincing enough. Once work was validated on my side (reading, printing, reading again, splitting, reading, insert everything in the box, ..) I took contact with the printer. They did not use PDF formatted-file as base material, but used instead the original InDesign project file so it's was perfect for them to print it with my requirements with their machines. Unfortunately, there were differences between result produced at home and their result done with their professional hardware.. it was not what I initially expected, especially regarding usage of gray color (shading issues). So I restarted all this work, again and again, and after two final proof I accepted the order... and waited a whole week in the wish it will be the right result this time. Actually, this period of production was quite stressful for me since it was a very expensive process: 200+ euros for a try.. and if everything goes well on their side (cf. printing is corresponding to provided source), then I have to be happy with result (whatever it is). 5/ The box is the size of the original CPC games. Were they hard to find or produce ? Even EasterEgg original sticker is present ! Yes, it precisely fits the original size. We are lucky here. From all the existing box formats of the time, lots of CPC games were actually using a double tape box (for both tape-based and 664/6128 disc-based games!). So I had to find such boxes.. I had one at home (box of M'Enfin! french-game was exactly what I looked for). At first, I was sad to realize that this "standard" was almost impossible to find nowadays.. Especially those without spikes that maintain tapes in it. Fortunately, after few months of research, I finally found out a British vendor that had 100 boxes available, exactly the right ones I was looking for ! but that vendor refused to post me the whole package to France.. so it's my cousin that picked up the precious treasure somewhere at London city, and from that day, everything was possible ! 6/ The 3" disc perfectly matches the plastic. Where did you find such material ? Just after having the boxes from England, a friend of mine proposed me to make a support for the disc. I did not believe about this myself.. but still - I sent him an original blister from the good old times so he could copy it - and eventually, improve it by adding a little room for a memory card (SDCard), "just if needed, in case of"..... and that's exactly what he did : a perfect job. 7/ Still about 3" disc, there are so rare nowadays. How did you do to find new batches ? I did like everyone would have done... I think. :) I went on eBay and such. 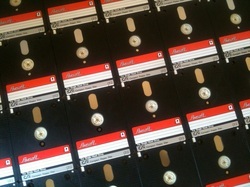 I was looking for new Amsoft discs.. not easy when we are a little picky, but in the end - we can find them. 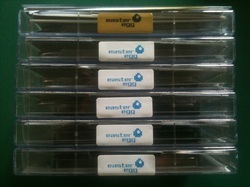 Some persons made me discount prices to support the project, some even offered me 1 box of ten 3" discs! Unfortunately.. it was very sad to realize that most of the disc had problems. Kept 20 years without being used did not help for sure.. At a time, I even thought this whole project would not be possible because of those discs, even if being so close of my original target. 8/ Game's poster is fantastic. Was it complicated to create ? Everything is made by hand.. patience is key. 9/ Could you share us some details, stories.. we probably missed ? Like you can read inside the manual, I reused the floppies illustrated in Discology software as spoof of caution pictograms. It's clearly a wink to this great software, because it's a model of ergonomy to me. And that allow me to make a second wink to the R-Type series. 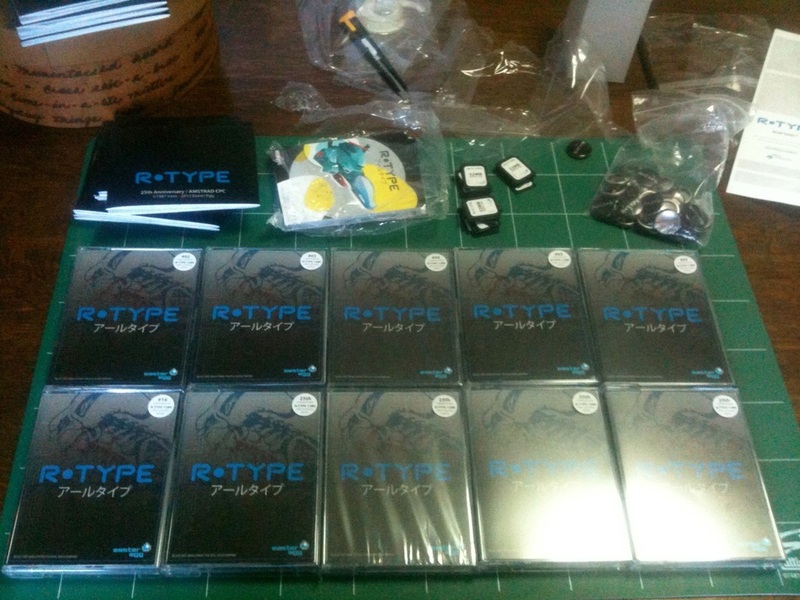 10/ Due to popular demand.. do you plan making another batches of the R-Type collector one day? Today, I would clearly say no, because I finished last box yesterday (mine, actually). "Collector" also means limited. After all, it really was for the 25th anniversary of R-Type (July 2012)... your very last chance to get one is to win contest at RGC 2012! (a french game convention). 11/ Some commercial games, in the early days, also featured great packaging. Do you think they had same approach than you ? Some software had approximative labels, probably using Amstrad DMP's printers and such :) Documentations sometimes also looked like very simple copies. To be honest, Julien inspired me in making this project the old fashioned way, by using original Amsoft discs and put a label over it, revealing a red strip at each edges. To me, only the covers was looking good at the time.. probably because this kind of job was not possible at home. 12/ A bit off-topic, but still.. what would be your reaction to see the whole thing sold on eBay ? Yeah, I know this will eventually come sooner or later.. of course I don't expect it. Seeing people making money reusing my work after having put so much efforts in it.. I would say to myself in that case that I did not give attention to the right person. 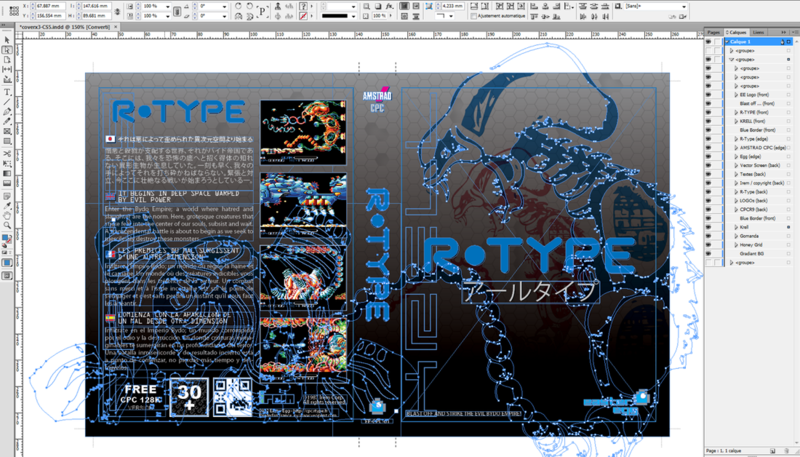 13/ Now that R-Type is finalized... Will EasterEgg, being a team dedicated to games, release another games using same high-standards regarding packaging ? I hope that EasterEgg will eventually release another games on CPC... if it's the case one day, I will use the same cover template for the packaging, and probably a similar content / approach. 14/ Is there something special you would like to add ? Thank you so much EasterEgg for providing such great feeling. In those days of DRM, digital content... releasing such a boxed version is a wonderful way to extend our enjoyment regarding games we used to play... and still continue to play !